Can you believe it's December already? Advent has started - yay! and it's time for another 'Winter Essentials' post! 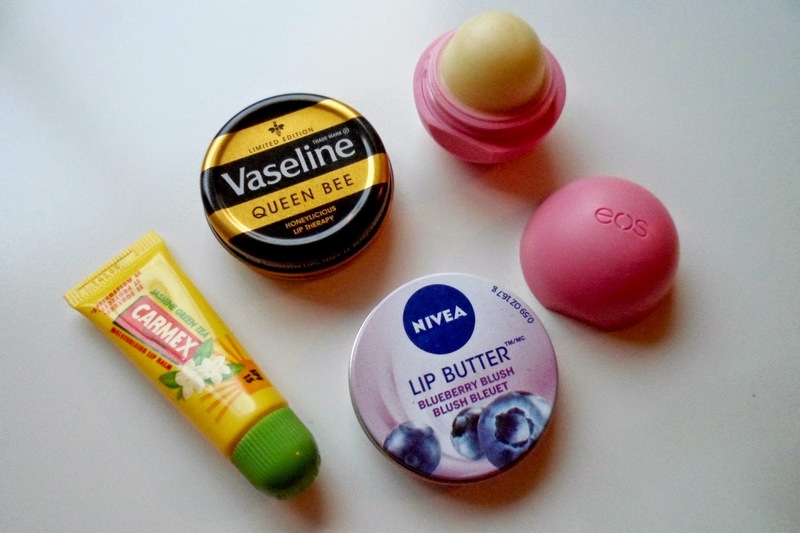 Lip balms I think are probably on the top of everyones list as a winter essential! Cold weather, air-con and windy wind make our lips chapped, dry and even a bit gross and flaky! Here's 4 of my top picks for lip balms - these save me from getting that awful trip-lip that we all dreaded as children.... you know what I mean right? Vaseline is a classic, I'm sure 99% of you either own one o these handy tins or have done in the past. This years limited edition is called 'Queen Bee' - I love the name and the packaing alike! The scent is honey... obvs and alot nicer than I was expecting - another one to add to my never ending collection of tins! I got this in Florida along with a blueberry version and they have become a huge favourite of mine! This is the lip balm that is currently in my hand bag! It's easy to apply, smells amazing and keeps my lips hydrated! Nivea Lip Butter's have been something I've raved about for months and months. They all smell amazing and are just as good as vaseline for keeping the lips chap-free, smooth and soft! A total bargain too at only £2.20ish each! What are your favourite lip balms for this time of year? Here are some tips given which help you to protect your skin from this winter season. The blueberry lip butter sounds amazing. Palmers Cocoa Butter lip balm. I love Blistex Intensive, always sorts my lips out! I want to try EOS, they're so cute! Jasmine green tea is my absolute fav so I'll definitely be trying this Carmex! Thanks for the tips! A favourite of mine atm is Nivea Lip Butter in Vanilla Macadamia - it has such a lovely scent and taste!